#  used for overlay mapping, moving fogs etc. #  will need to create the layer for each map required. #  I recommend not using too many layers as it could start to cause lag. #  my archive for anyone to use. #  #  yoffset    - these 0 to fix the layer to the map. #                     # need to use the refresh_layers script call right after. #                     # map doesn't require refreshing. #  del_blayer(layer_id)       # Removes a layer from battles. #  #  work the same as map layers without the need for a map id at the start. #  #  during as well, if you refresh the layers. #  NO SCRIPT SETTINGS. DO NOT EDIT BELOW UNLESS YOU KNOW WHAT YOU ARE DOING. need_refresh = true if $game_map.layers[map][id].nil? need_refresh = true if $game_map.blayers[id].nil? It always seems to be telling me, that it doesn’t find the file in Graphics/Layers, even though it’s clearly there. Even when changing absolutely nothing from one project where it works (or the demo that is) to another, while also using the exact same script commands, it just throws an error even though the file is in that exact location, it’s frustrating, really. It’s frustrating, really, when people come here to complain and don’t supply any information that would help me help them or even ask nicely for help. If the rpgmaker error is telling you that it cannot find a file in a certain location, first thing comes to mind is that the file is not in that location. – Make sure you are putting the files in the right place. – Make sure it’s a file that rpgmaker supports. It was not my intention to complain, nor to insult you. I’m terribly sorry if it appeared that way. I was very tired when I wrote that yesterday (it was like, 1 AM here) and I didn’t realise I was being that offensive… Let me try again, I hope you can forgive my rudeness earlier. Now as for additional information, the Event is running in a parallel process, starts as soon as the game begins, so the error is immediately after starting up, I don’t use a save file, it occurs on a new game. Again, please, I did not mean to be rude, nor to offend you… I feel like a terrible person right now. If there’s any other information I could provide you with, I’d be glad to do so. Thanks for considering to help me out! 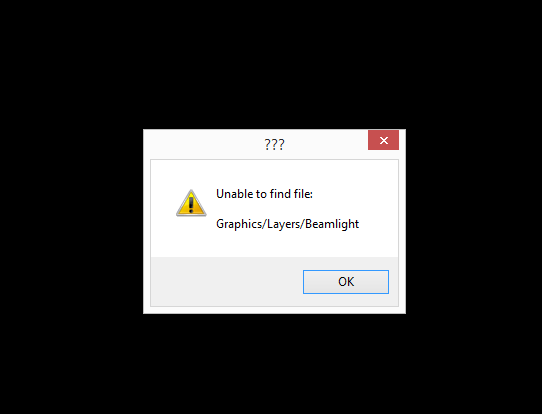 I have never seen the error you get appear if the file exists. Make sure you are editing the same project that you placed the files in (Project1). Make sure you dont have multiple Project1 folders and you’re placing the files in a different one. I have not encountered anything else that cause this error other than files not actually being there. Oddly enough, it appears that my secondary hard drive messed something up. I just copied the whole project into the main one, C: and it appears to be working now. Really, really weird. Anyway, thanks for your extremely quick help, I really appreciate it! Also, sorry for my behaviour yesterday again. Do you think there’d be a way other than event graphics to have it act as though the images ARE event-like, as in you can go in front of it with characters, behind it, as it’s acting like a regular character sprite? But no, seriously, awesome script I love it! If you don’t mind pointing me in the right direction to add this option to your script!!! Thank you very much!!! I’ll be trying on my side too! In the end, I ended up using your xoffset and yoffset’s definitions as recipients for the xoffset/yoffset option AND the zoomx/zoomy, no errors but I don’t have much guarantee as far as compability goes hahaha^^ Anyway, I don’t use much scripts so it’s okay for my use. I also implemented the possibility to change opacity through time/duration instead of instantly (I think I took and modified a piece of one of Hime’s script to add the option to yours) and it is working well until now. I have used it for very interesting opacity changes on my moving clouds shadows layer, works like a charm! Thanks a lot for the simplicity of use of your awesome script! I need to make a scene in which I make use of of the zoom option to see if it can be usable!! !